What kid doesn’t love fruit snacks? I know I have a three year old who definitely loves the little packet of fruit snacks. A year or so ago as we started to eliminate processed foods we knew that this was one thing that had to go. Now, of course, he still has them for a treat every now and then but we don’t buy them at home. The store bought ones are often full of sugar, high fructose corn syrup and artificial dyes. I recently came across this recipe for homemade fruit snacks and I knew I needed to give it a try. They were so easy to make I will definitely make them again in the future. You can use any kind of berries so there are so many ways to change them up. Jackson loved them and couldn’t get enough. I portioned them out in little bags so that he could have them as a treat. I can’t wait to hear what you think of when you try them. I was unable to find the grass-fed gelatin like requested in the original recipe. So they could be even better for you if you can find it. What are some processed snacks your kids love but aren’t the best for them? I would love to try to find healthy ways to make these snacks at home. Pour juice and fruit into a small saucepan. Heat over medium heat , stirring occasionally until berries become tender and begin to soften. Add honey and stir until completely incorporated. Puree mixture using an immersion blender or small blender. Let it sit off the heat for 5-10 minutes. Slowly whisk in gelatin 1 tablespoon at a time then whisk generously until completely incorporated. Pour into a 8x8 or 9x9 glass dish. Refrigerate until set about 30-60 minutes. Recipe adapted from Thank Your Body. Yum! I love how healthy these snacks are! I am going to make this this weekend!! Love the recipe! Thanks for sharing! 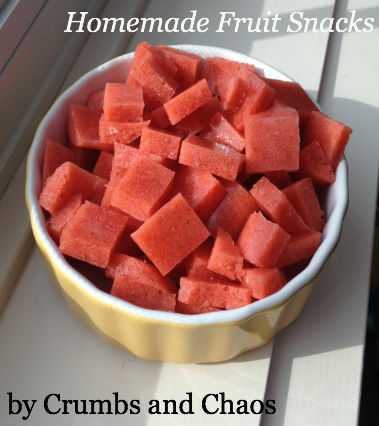 As someone with a serious fruit snack addiction – I’ve been known to eat an entire box in a weekend – I am blown away by the fact that you can actually make them yourself!! I’m definitely pinning this for future use. Thanks so much for sharing! These look awesome! Do you know how long they will stay fresh? I’d like to make a large batch and have them last longer. Crystal Garner recently posted..Just Keep Swimming! They’ve actually only lasted a few days around our house. But I’m betting they would be good at least a week in the fridge. Let us know how long they keep for if you try making a big batch. Thanks! This fruit snacks looks good!.